If one were to search for 'Hong Kong protests' in China in recent days there would be no mention of the huge numbers of citizens who came out to protest Chinese rule. Instead one would be confronted with a familiar message stating that due to 'relevant laws' not all search results could be displayed. It is precisely this type of control and censorship that the people of Hong Kong fear. As the electorate of only 0.02% of the Hong Kong population went to the polls in March, others held their own mock election to protest the lack of true democracy [Al Jazeera - YouTube] . But such protests fall on deaf ears, and are certainly not reported in mainland China. And with most of those voting showing loyalty to Beijing it was no surprise that Leung clinched the leadership role. His win was celebrated this last week by mainland China who sent president Hu Jintao to Hong Kong to attend the inauguration of the Hong Kong chief executive. But he was not given a warm reception and faced protests, heckles and a critical media. As Hu made a speech during the swearing in of Hong Kong's new leader one man interrupted the Chinese president [Guardian]. Election committee member, Ken Tsang shouted slogans, demanding an end of one-party rule in China and the vindication of the bloody crackdown at Tiananmen Square in 1989, before being wrestled away by several security personnel [ITN - video]. Apple Daily also alleged that one of their photographers was warned off taking pictures of the motorcade carrying the Chinese leader. According to the paper a sniper from a helicopter sighted him and shined a yellow light on his face and eyes as a warning [Apple Daily - Chinese]. 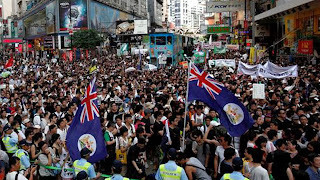 The strict security which included Dolphin helicopters, snipers armed with HKG36 assault rifles, marine police launches and deployments of police on bridges and buildings around the city did not deter tens of thousands taking to the streets in protest against Chinese rule. Streets were packed with demonstrators, some even carrying British colonial flags, who called for the right to elect their own leaders and for a greater say in the way the region is run [BBC / CBC / NYT / VOA / Washington Post / WSJ / RightNow I/O // Video reports: CNN / Al Jazeera / NTD TV]. On Saturday police had to shield the president from demonstrators, and officers used pepper spray to disperse crowds who were demanding an investigation into the death in China of a Tiananmen activist, Li Wangyang, earlier this year. He had supposedly committed suicide but many of his supporters both inside and outside the mainland believe he was murdered [Bloomberg]. Even a senior Hong Kong official has described the death of Chinese dissident Li Wangyang as suspicious [BBC]. Reports in state run media reports in Hong Kong have said that an investigation would be conducted and that a verdict would be published "in a timely manner" [HKCNA - Chinese]. However there is a great deal of skepticism amongst pro-democracy campaigners [BBC]. When Margaret Thatcher signed the Sino-British Joint Declaration with Deng Xiaoping in 1984 there was criticism from many Hong Kong residents that they had been abandoned to a totalitarian regime. During one meeting before the press and interested parties she was asked whether her decision was ethical. "Prime Minister, on Wednesday you signed an agreement with China promising to deliver the handover of 5 million people into the hands of a Communist dictatorship. Is this morally defensible?" Emily Lau, a Hong Kong Legislative Councillor at the time, asked. Thatcher dismissed her concerns saying her views were likely the exception. "I think you would have had great cause to complain had the government of Great Britain done nothing until 1997. And I believe that most of the people, indeed the overwhelming number of people in Hong Kong think the same," the then Prime Minister responded [ITN - YouTube / ABC full transcript]. More than two decades later and ten years after the handover to China, Margaret Thatcher expressed her regret at not being able to negotiate an extension of the lease. In a radio interview with the BBC she said she faced an "impossible" situation. The interview secured with David Tang a was broadcast as part of the BBC Radio 4 series Hong Kong: A Decade of Change [Telegraph]. "What I wanted was a continuation of British administration," she said. "But when this proved impossible, I saw the opportunity to preserve most of what was unique to Hong Kong through applying Mr Deng's [one country, two systems] idea to our circumstances." For ordinary people in Hong Kong the concerns hinge around democracy, freedom and their own economic situation with a growing rich poor divide. For the business community, there are fewer concerns. Richard Beales, a banker and columnist with Reuters, says that CY Leung was a "bit different" from past leaders and offered new change [Reuters - YouTube]. "Hong Kong is hitched to China and there is no escaping that," Beales says. But the key issue is whether Leung will be able to implement reforms. Any reforms are likely to be slight, and mainly focused on economic prosperity. There is a growing sense of anger amongst anger amongst many people who are unhappy with record property prices, an increasing wealth gap, a lack of democracy and a string of political scandals. China has in many ways made a rod for its own back by its reclamation of the Hong Kong peninsula. While the handover boosted national pride within the mainland, the one country two systems is becoming a thorn in the side for Beijing. There are contradictions faced by the Chinese Communist Party concerning its treatment of Hong Kong and the rest of China. While the calls for greater democracy will grow in Hong Kong, those living on the mainland will also wonder why they too cannot have the same rights and freedoms. By imposing similar restrictions and rules in Hong Kong as seen on the mainland will likely create social unrest. To ignore the calls for democracy in the mainland will also become more troublesome for China's authorities. More and more the new generations will ask why some Chinese, those in Hong Kong, can vote, access a free Internet and protest while others cannot. China could gradually move towards a free and democratic state, based on similar principles seen in Hong Kong, which itself needs to improve democratically. But many in Hong Kong fear that Beijing is likely to become more assertive and draconian. There are certainly no signs that the CCP is willing to relinquish its grip on power just yet.